The SymmetryBreakfast account is one of Instagram’s most peculiar sensations. Every day it posts a single picture of breakfast for two, symmetrically plated and positioned. We love it, and judging by its 90,990 followers so do lots of people. This weekend, the account makes its first foray off the internet and into the real world, with a breakfast takeover at Bethnal Green’s Corner Room restaurant. 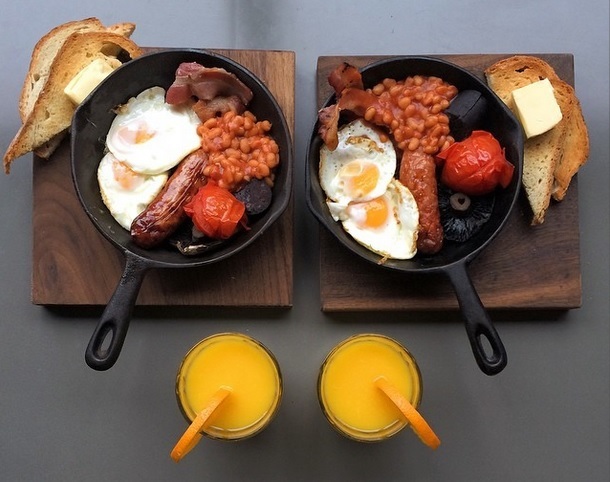 The breakfasts are available from 7.30-10.30am and served in symmetry, meaning you need to bring a friend and be prepared to eat the same as them. The menu includes smoked salmon from Stoke Newington-based Hansen & Lydersen and drop scones with sweet-cured bacon and maple syrup, priced at £19 and £15 respectively for the pair of portions. This Sunday sees something a bit special come to Covent Garden burger bar Shake Shack: a creation from three Michelin-starred Italian chef Massimo Bottura. His Emilia burger — named after his home region of Emilia Romagna — features a beef patty made with ground cotechino sausage and parmesan topped with salsa verde and balsamic vinegar mayonnaise. The burgers cost £8.25 and are available from 11am on Sunday, but there are only 500 available and once they’re gone, they’re gone. At Londonist we love a good map almost as much as we love a good eat. Thanks then, to Londonist reader Mike David Smith who responded to our recent news stories on the latest London restaurants and gastropubs to get Michelin’s seal of approval by creating a map of them all. You can see the map here — as well as being useful for planning your dining out, it also shows which parts of London are heavy on stars and which are seriously lacking. This week Japanese restaurant Kouzu has opened in Belgravia, brought about by one of the Zuma founders, lunch-only Danish restaurant Snaps & Rye has launched in Notting Hill, and 108 Brasserie in Marylebone has re-opened after an extensive refurb. Tomorrow sees the arrival of Dishoom in King’s Cross, the third branch for the Bombay Café-styled group, while at the weekend, Gordon Ramsay’s latest venture Heddon Street Kitchen opens near Piccadilly Circus.